Help CPP change the way public school meals are prepared and improve the health of the future generations of young people. If you have never come to Brazil, you probably have a misperception of the reality around here. The bright economic moment, the colourful festivals and the testimonials about the warmth of the people may have lead you to believe that we live in good and relatively fair society. This is not true. Brazil is among the ten top countries in social inequality and Recife is no different. While there are people living in 2 million dollars apartments, there are thousands of people living in slums and under the poverty line. And it gets worse: there are those who don’t even have a shed in a slum to go and spend the night; children who were abandoned by their families and by the public services or that were pulled onto the streets by drug addiction and crime. The Comunidade dos Pequenos Profetas (CPP) works to bring some light into these children’s lives. The reasons why they go to the streets are numerous. But most of the young people assisted by CPP are already on crack or some other substance and almost one third of them have already dropped school. Many of them come (or are) in a context of sexual abuse and violence. CPP has always understood the importance of good nutrition in order to give these children any chance of fighting. Over the years, their social gastronomy work became more and more acknowledged. Today, they run an initiative called “Vertical Gardens”, where they teach kids about sustainability and how to grow and cook their own food, without chemicals or industrialised products. You can see the video here: http://youtu.be/8d1vg6kvt2s (Portuguese only).So what can anyone actually do to change this? We do not have all the answers, but CPP certainly has a few. The headquarters work as an open space, where the kids come at any time, and take a bath, have a meal and get involved in recreational and educational activities. CPP promotes cultural activities and values African-Brazilian culture. They try to provide the kids with the tools needed to step out of the underworld of drugs and try to reinsert them into their families, the society and the job market. Today, CPP assists over 400 kids and teens, between 7 and 21 years old. Now CPP wants to expand this initiative. 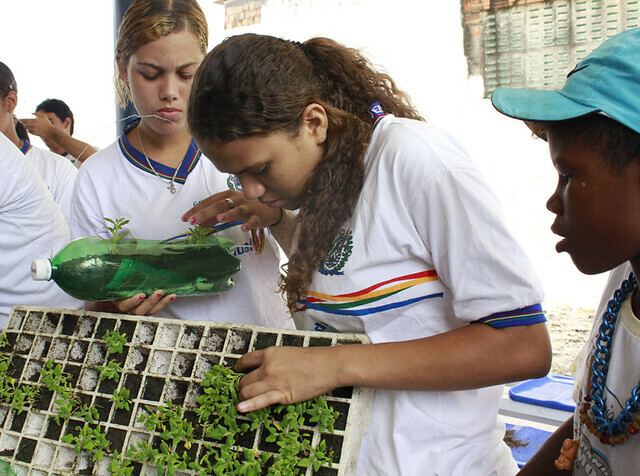 The idea is to implement this project in public schools in Pernambuco, changing the way the State sees and prepares school meals. This is necessary in a context where, for most of the children, school lunch is the main meal of the day. If this meal is not healthy and nutritious, and they don’t get that at home either, how can we expect these children to grow healthy and achieve their full potential? The TIE campaign will help publicise this project and develop the appropriate communication strategy to get more city councils on board and thus more schools with natural, healthy and sustainable meals. Ultimately, this project will benefit generations to come and hopefully influence public politics on school nutrition.